The slide mount for this capture of EL activity at Binghamton indicates "June 72" suggesting this photo was taken around the time of or just prior to the disastrous Hurricane Agnes flooding west of Elmira along the Chemung River that occurred 6/23/72 leading EL to declare bankruptcy. 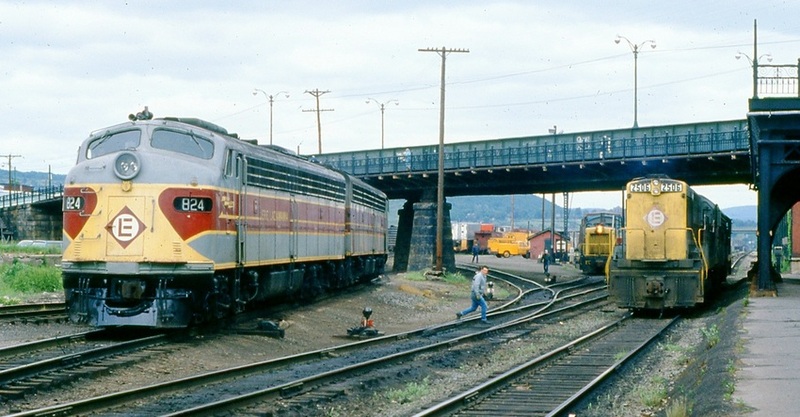 In this scene, an eb freight has arrived led by a mish mash of power: the U25B-F7B-U25B trio on the right had been MU'ed to the two fairly clean E8s that are heading for the spur in front of the Kingsley Building. Meanwhile. the switcher shifts cars around the fairly fully LIberty St yard. Photographed by John Barlow, June, 1972. Added to the photo archive by John Barlow, March 20, 2019.